Ready for SaSS#15 and audiobook finally out! Well, I’m all packed and ready for SaSS#15 tomorrow. Yes, I’m going in the morning since the town is only two hours away. I’m bringing Wrapped, Ghosts #1, The Contracts, Hearts Under Ice, Paper Hearts, Sweet Love, Cirque Macabre, and Lengths for Love with me. I left my Easter basket at work so I got a Halloween bucket instead and I’m raffling away a bunch of stuff in it; candy, two of my books, bookmarks, postcards, lip balms, other swag, and 3 free audiobooks for the winner. I’m a little burned out as well because my grandmother passed away last night so it’s hard to be both excited and sad at the same time. I’m still coming though! It’s too late to back out now. After what felt like eternity, Sweet Love’s audiobook is finally out! That’s about it for now. I will have pictures tomorrow! Live books and free audiobook codes! Guess what’s live today? That’s right, The Reaper’s Apprentices #2 is finally live! Here’s a link to both book 1 and 2 so you can catch up with the story. You don’t necessarily need to read book 1 but it would be nice. Just posting US links for now but I will add others later. In addition to that, TRA #2 is available on Smashwords as is the next Black Paradise Circus book. Black Paradise Circus #2 comes out on the 22nd. You can preorder it from Amazon now though. Lastly, I have free audiobook codes for Wrapped in Death and Chocolate! If you want a free audiobook, drop me a line! I’ve also seen the final cover to Patterns & Parallels #2: Paper Hearts. Gah, I can’t wait to show you! I think I’ll do an early cover reveal for it. I promise to slow down on posts. I know the news is coming quickly but that happens! Wrapped in Death and Chocolate now out on audio! After long last, Wrapped in Death and Chocolate finally made it to audiobook. I have been waiting for a long time tbh. This is great because now those who like audiobooks can get this one! I could always use audiobook reviewers so if you’re interested, let me know. If you’ve never read it, it’s now available practically everywhere. Also, in case you missed it, both The Reaper’s Apprentices #2 and Black Paradise Circus #2 are available on pre-order on Kindle. If you can’t wait that long for any of them, Black Paradise Circus #2 is available and live on Smashwords and Itunes right now. I do apologize for all the links and the sudden news but when it rains, it doesn’t trickle. It pours. I will try to space everything out as much as I can. I have a lot to talk about over the next few days so please bear with me. This one will be a short, quick update. I’ll go into details later. First off, Smashwords is being kinda hard to deal with regarding preorders so I’ve decided I won’t bring back The Reaper’s Apprentices #2 until September 14th. I’m sorry but it’s being a pain. You can still pre-order the book in other places. (Links for that a little later) I’ve also decided no more pre-order over there. The second thing regarding Smashwords is that I’m close to a big milestone over there. If I reach it, I might do something big and special regarding it. Third thing, I’m still waiting on Audible to get Wrapped in Death and Chocolate up for audio. It’s headed to retail now and I just have to wait. Waiting really is the hardest part. The audiobooks for Four of the Usual Suspects and Sweet Love are also coming along and sound great. The Reaper’s Apprentices #2 will be out on September 14th. Black Paradise Circus #2 will be out September 28th. Patterns & Parallels #3 will be out October 11th. Flavors of Love #2 will be out either sometime late October or early November. That will probably wrap up the new books for the year of 2015. I may or may not release another PC book in December but I’m not sure on that yet. One day soon, I will make a master list of every series and universe. it will be for the sake of readers and myself as well. Finally, the main thing. Buy links! There’s no need to read book 1 to get book 2 but I do recommend it. Book 3 will come out next year and then the beginning arc will be over. Then we get into the bigger, good stuff. New swag, updates, and more. I promised I wasn’t going to update again so soon but a lot of stuff happened towards the end of the week. Go figure. First off, I finally got TRA #2 back to me and sent to get formatted. It’s officially called The Reaper’s Apprentices #2: The Contracts. The release date is September14TH (cause one of the main characters is born on that day too) and I’ll have it up for pre-order as soon as it comes back from formatting. In the meantime, you can go ahead and add it to your libraries at Smashwords. I’ll probably fix the description too. It’s so hard to write this one’s description. Secondly…Wrapped in Death and Chocolate’s audiobook is done! I’m just waiting for it to be approved. It’ll show up on the Amazon links. If you want to follow along or read the story ahead of time, you can get it here. Third piece of news, I got a glimpse of the possible new cover to Patterns & Parallels #2 and it looks just as great! P&P #2 goes to the editor on the 8th. Hopefully, I can get swag for it before SASS. Fourth and final piece of news…here are pics of new swag! Thanks to Kelli’s Kollectables and Sweet Book Swag for them! I can’t wait to my hands on them! 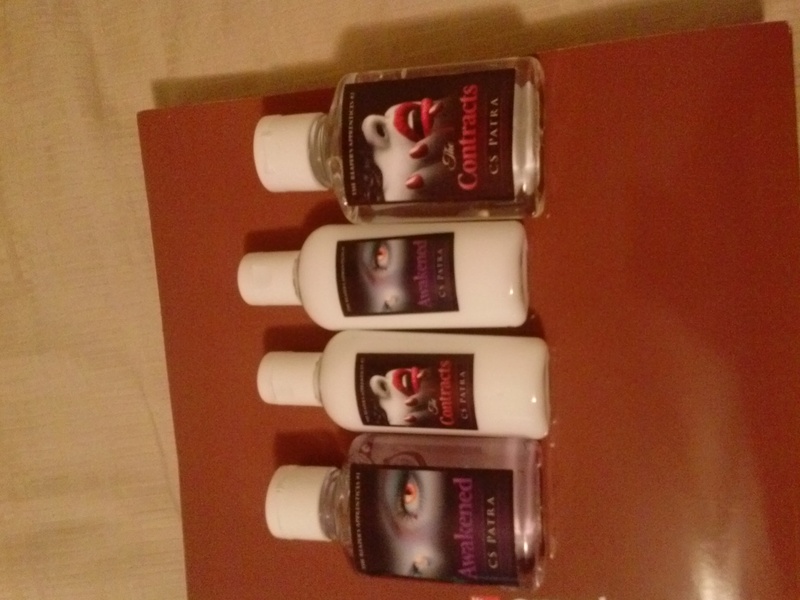 The hand sanitzer and lotions came this afternoon and I know the others are on the way. Then I’ll probably make something for P&P #2, the Black Paradise Circus arc, and Four of the Usual Suspects and that’ll be it. The other two books are still in the same spot. I’ll return to them soon.